Intelligence gathers at a party for Kelton, the Superintendent of Police that's running for Mayor of Chicago. At the event, Voight runs into well-known Defense Attorney Hoffman, who is found dead in his apartment just a few hours later. At first glance, the scene of the crime looks like a run of the mill robbery, however, as Intelligence dives deeper, they realize Kelton wasn't "direct" with them. Even when Voight pressed him about visiting Kelton roughly 30-minutes before the shooting, Kelton denied knowing anything. They traced the stolen jewelry to a young teen named DeVante who cracked under pressure and admitted his cousin, Griffin, killed Hoffman. As they attempt to nail Griffin, Atwater gets shot and loses consciousness in the street. DeVante also takes a few bullets. Atwater, who survives his tricky surgery, later learns that DeVante passed. As they pursue Griffin, they find more evidence that Kelton was working with the gangs to boost his votes, specifically in the South Side of Chicago. When they search Griffin's home, they arrest his baby momma who admits that she saw Griffin chatting up a blonde woman in a black SUV. Voight realizes that the woman is Brennan. After they arrest Griffin, Brennan pays Voight a visit asking him to "look the other way" and release Griffin. Voight refuses, blaming her and Kelton for playing dirty and being the reason one of his men almost died. 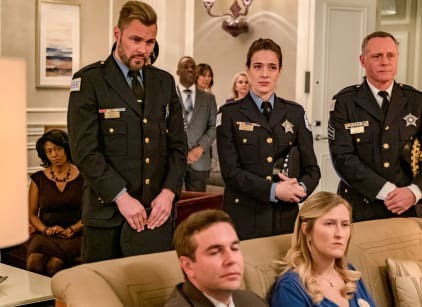 Voight is ready to blow the lid off of Kelton's campaign and expose him, but Halstead steps in as the voice of reason to assure him it would make him look like the bad guy. Meanwhile, Antonio returns to work after his stint in rehab. He seems very eager to "prove himself" again, but when he makes an arrest and hides the pills from a suspect in his vest, Burgess demands he hand them over. She promises it's tough love and that she's just looking out for him, which Antonio understands.